The following is stories shared by my mother Millicent Halma (nee Hurst) – preferred name Janne. This page is still being completed. 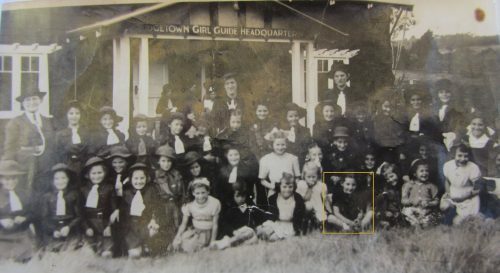 I was born in 1938 and spent the first 9 years of my life growing up on a farm, known as Sunnyhurst, in Bridgetown with my parents and grandparents. 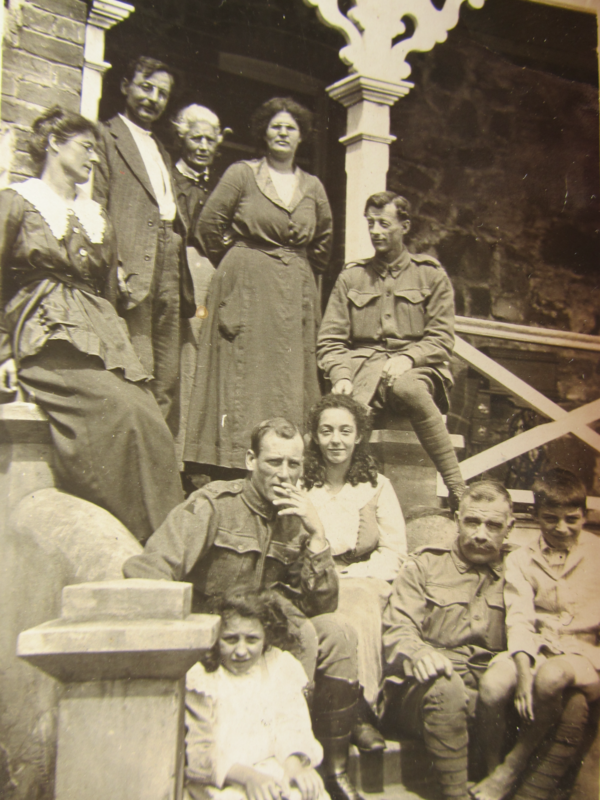 My grandparents, Ern and Mollie Hill, great grandmother Emma Jane Day and great Aunt Millicent Day were part of E.Day and Co. registered by Emma Jane Day and Ern Hill. E. Day and Co owned a series of businesses including a general store and sawmills which were sold as the family developed their farm, Sunnyhurst, which included apple orchards and sheep. 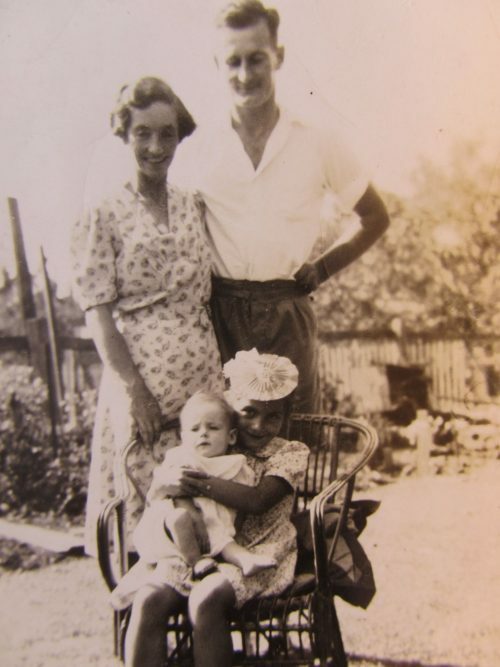 My extended family were involved in numerous local organizations including the Bridgetown local health board, Bridgetown Fruit Grower’s Association, Bridgetown Road Board, Bridgetown Bowling club, Freemasons and Red Cross. 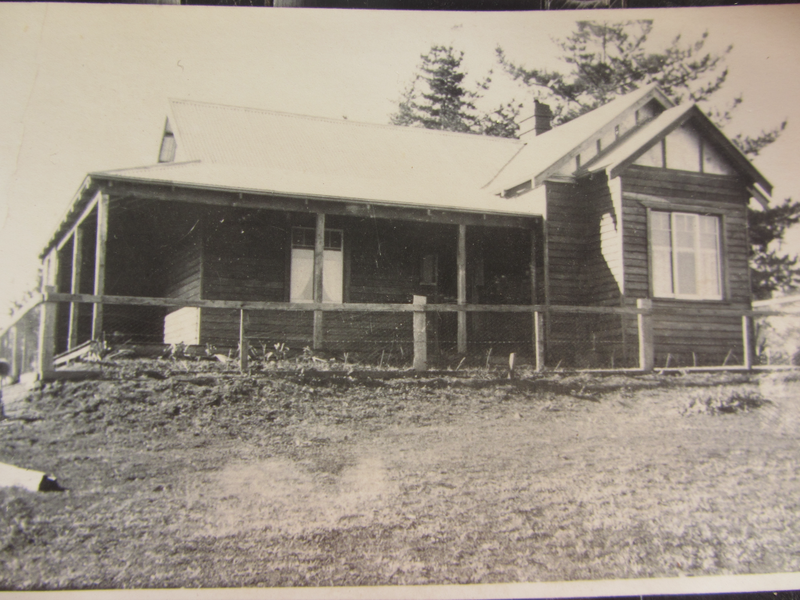 The family built Sunnyhurst Homestead in 1905 which was an impressive homestead for its time. 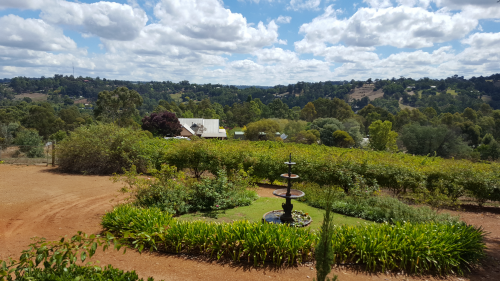 Sunnyhurst had a substantial and impressive garden around the front of the house with views overlooking the valley. My grandparents were considered people of importance in Bridgetown when I was growing up. Bridge parties and tennis parties were often held at Sunnyhurst. Farm had apples, pears and sheep and a few cows. Back row: Millicent Day, Ern Hill, Emma Jane Day, Mollie Hill, ? 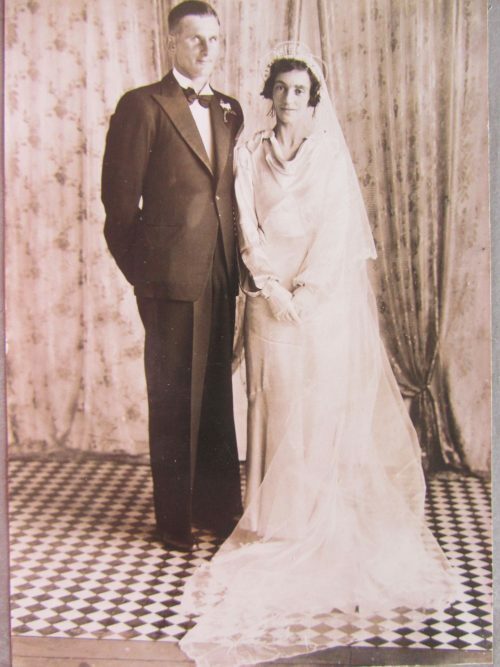 My parents Clarice and Charles Herbert Hurst married on Oct 26, 1936 when my mother Clarice was 33. They lived in a small cottage next to the Sunnyhurst Homestead. My mother adored my father who wanted a son to carry on the family name. 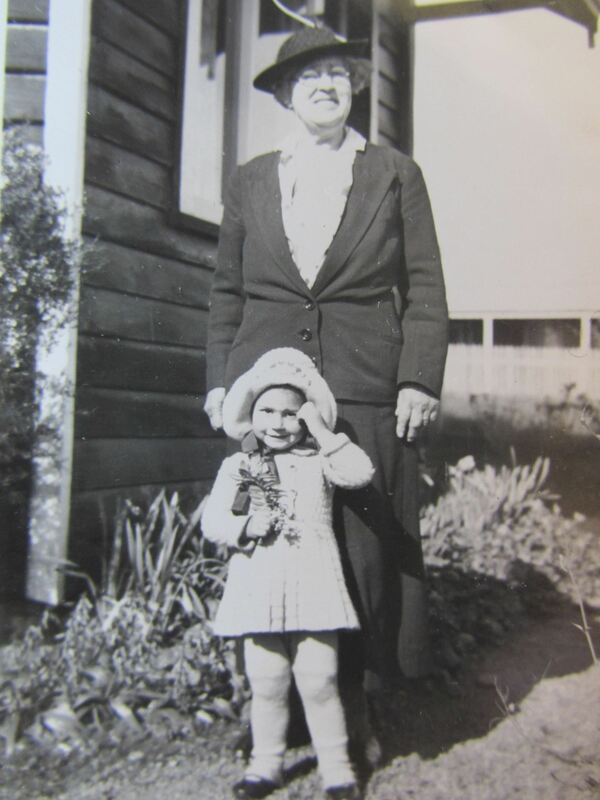 My mother’s first pregnancy was with me when she was 34. She had no understanding of children and proceeded to provided a very hygienic unrealistic environment. Everything was sterilized and children were to be seen but not heard. Between the age of 2-3 I developed a cyst that resulted in all of my hair being shaved off for surgery. Having my hair shaved off spoiled my doll like image. 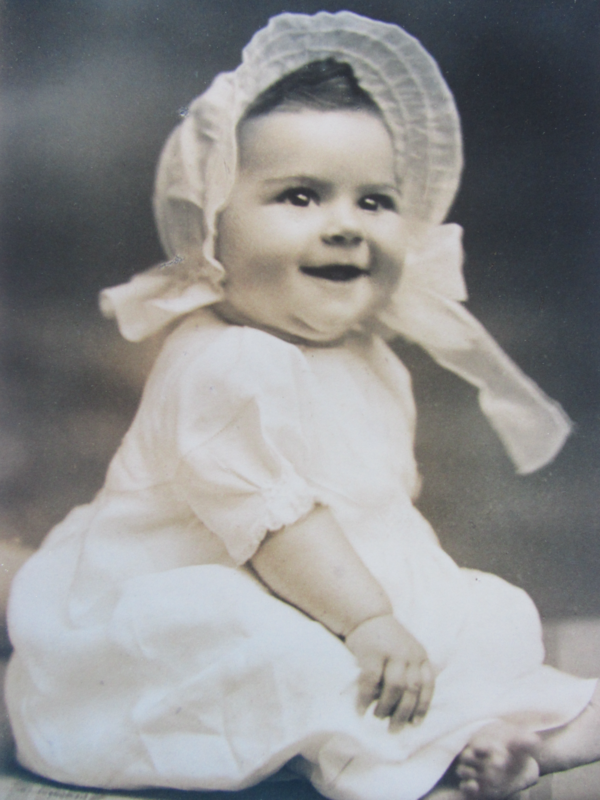 When World War II started I was just over a year old. During this time I can remember getting a chocolate Easter egg surrounded with flavored centers coated in chocolate from my Uncle Jack (W.J Day from Albany) when I was about 3 years old. This was the last chocolate we saw during the war period and you couldn’t buy chocolate until long after World War II ended. My parents only gave me a small piece of chocolate because the doctor had put me on a special restricted diet as he thought some of my illnesses were related to diet. My grandfather Ern Hill would use rations to buy licorice all-sorts which I hated! Ern was a typical self made man. Tough and respected those that stood up to him. Only a few people like my Grandfather had a radio and I used to listen to the radio with my Grandfather. I remember having to sit very quietly with my Grandfather Ern inside Sunnyhurst listening to the war news on his radio. Other items that were rationed included teas, clothing and fabric. Fabric to make clothes was very hard to obtain. During the war years petrol was rationed. People who needed to use a lot of fuel such as the doctor had gas producers attached to their car. Headlights were covered partly with black to reduce light for fear the Japanese would see. Power often went off at night time. It was owned by a private power company. Windows in the houses had black out curtains and you would get a fine if a light could be seen from outside. We had a twin tub washing machine at Sunnyhurst. Very few people had these types of washing machines in Australia; became more common later in the 1950’s. Ours was a America twin tub made before the war. I remember my mum getting up early in the mornings to milk cows as part of our war effort was to provide milk and butter. We had metal lined rooms next to the Smithy (used for shoeing horse) where there were feed chambers to protect the live stock food from pests. During the war sheep killed on the farm were shared between four families – our family and the two Marshall families. We took turns as to which part of the sheep you go. Sugar and tea were limited during this time. Lots of things disappeared from the menu including lollies, ice cream. I remember visiting my Grandmother Molly at the Mount Hospital in Perth when it was in Mount street and outside in the park were trenches for air raids. I saw the catalina amphibious aircraft in the Swan River. During the war I used to sew up brown paper bags which were filled with items that the Red Cross sold to raise funds for their war effort. The Red Cross did a range of activities including a penny chain where you added a penny to the path to see how far the chain could stretch along the street. Money raised was used to send parcels to military personnel. I can remember the celebration at the end of the War at the showgrounds. I can remember after the war I can remember there was some resentment towards returned soldiers as they got preferential treatment for jobs. My mother had many miscarriages before carrying my brother Richard to full term when she was 40 and I was 6. Ric was very sickly and wasn’t expected to survive. As a consequence of my mother’s pregnancy and my brother’s sickness I wasn’t able to start school at the beginning of the school year. I didn’t start Grade 1 until August, 1944 in the last term of the school year. As a result I didn’t learn much. I was bullied by other students and as a result became violent to those that bullied me. I didn’t learn much during this time and so I was held back a year. When my father was 96 years old I learnt that he knew about the bullying but did nothing about it. I was taken back by why he never intervened. 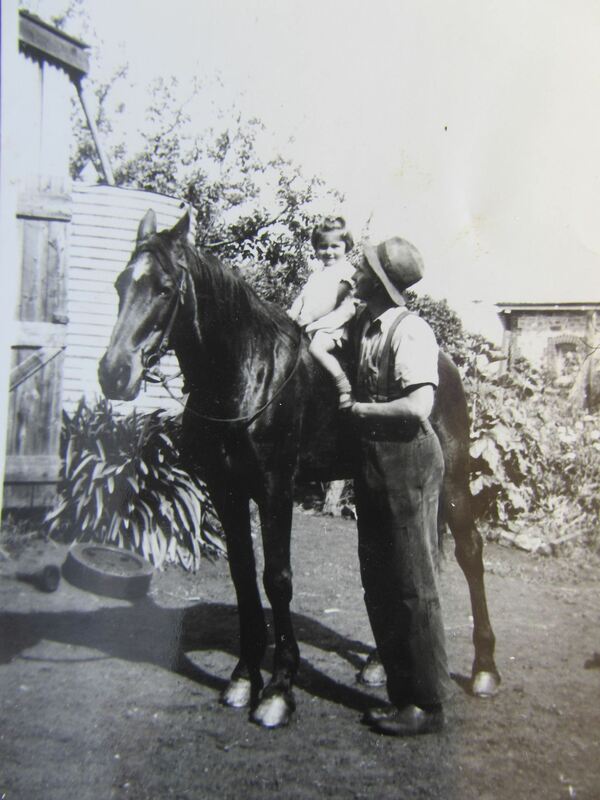 My grandfather had given me a horse, dartmore pony. I became quite fearless with my pony which I adored. 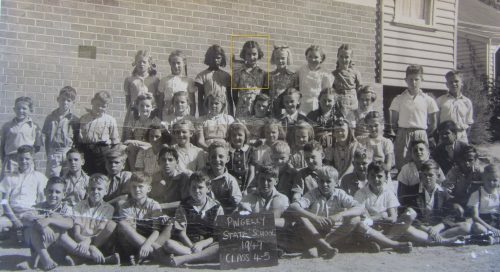 I hated attending Bridgetown Primary School and refused to return to school. My father realised I could attend Kangaroo Gully school which was close to our farm. He constructed a bush shelter near the school which I used as a stable for my pony which I would ride to school. I love Kangaroo Gully school. There were 9 other students, we all got on well, had fun and played well together. Everything was great until we got a new teacher. The teacher was a local girl who also rode her horse to school. Her horse was bigger than my pony and would break out of the bush shelter taking my pony with it. I spent lots of time looking for her horse and my pony — which was disruptive for schooling. 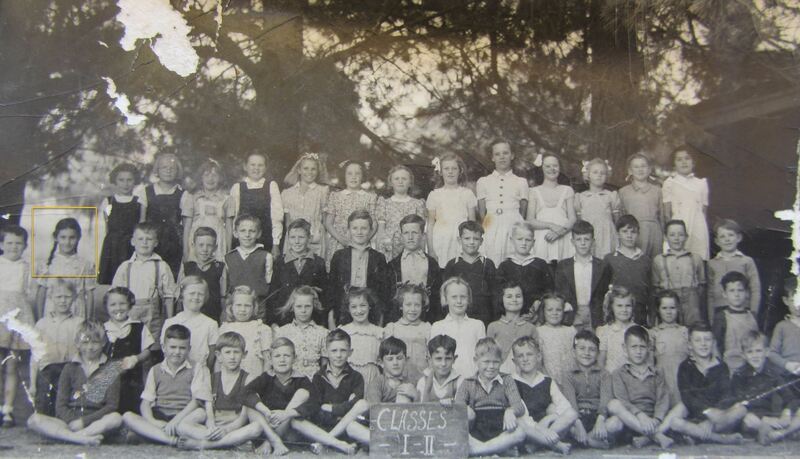 My first teacher at Kangaroo Gully used to board with parents that lived across from the school. Part of their employment conditions was that local parents had to provide board and lodging for the teachers at the bush schools. Very few people had motor vehicles. Often only the farmers had motor vehicles. The young teachers had no money to spend, no car which is why board and lodging was part of their employment conditions. I did not wear a school uniform. In winter I wore skirts and jumper. In summer I wore cotton frocks. I don’t think shorts and pants would have been allowed. It wasn’t long after World War II which meant clothing options were limited. Lunch for school was a normal cut lunch from home. Which was white bread and jam or vegemite, maybe cheese and fruit. I used to ride to school from Sunnyhurst to Kangaroo Gully School. The ride would take about 30 minutes and my father fixed up the stable so my pony was left in the stable while I was at school. The curriculum at Kangaroo Gully school was the same as what was taught at Bridgetown primary school but all the students from Grade one through to Grade six were in the one class so the teacher needed to provide work for each grade level. World War II history wasn’t taught as we lived through it. Students wrote on paper using pen and pencil. I can remember a few of the Gregory children, Moore children and Goodwin children. I think my best friends were Kathy and Laura Goodwin who I later meet up with a High school at Perth Girl’s and I used to visit their farm in Gosnells when I was a teenager. The school had an open fire for winter and the students had to bring in the wood. Cooling wasn’t needed in summer. Snakes were occasionally spotted when riding home from school but can’t remember seeing any snakes around the school. School was from 9 to 3. Holidays were 2 weeks in May and August, 6 weeks over Christmas. Most of the public holidays are the same as what we celebrate today. I remembers going to movies at the town hall with my school. Including the movie The Overlander, Lassie come home and My Friend Flicker. I went to one circus with my parents. Friday was shopping day and there was often street stalls in the main street of Bridgetown. My grandmother had a house maid. Her role was to clean the house who came several days a week. 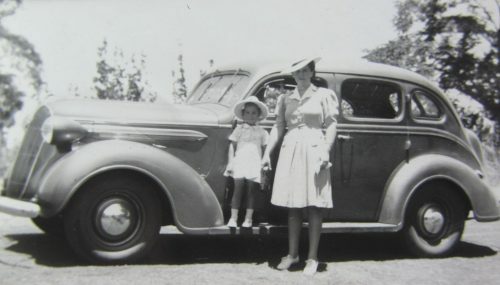 The family had one car that was shared between the grandparents and my parents. Our car was completely enclosed where as our neighbors had canvas covered cars which weren’t completely enclosed with perplex windows. The toilet was outside the house and my job was to empty the bed pans in the morning. Sunnyhurst may have had an internal toilet but our house had an outdoor toilet that was quite a distance from the property. In 1947 when I was 9 years old my grandfather Ern Hill had a health crisis and decided to sell up and distribute the shares of the partnership within the family. I was sad to leave Bridgetown and my friends. 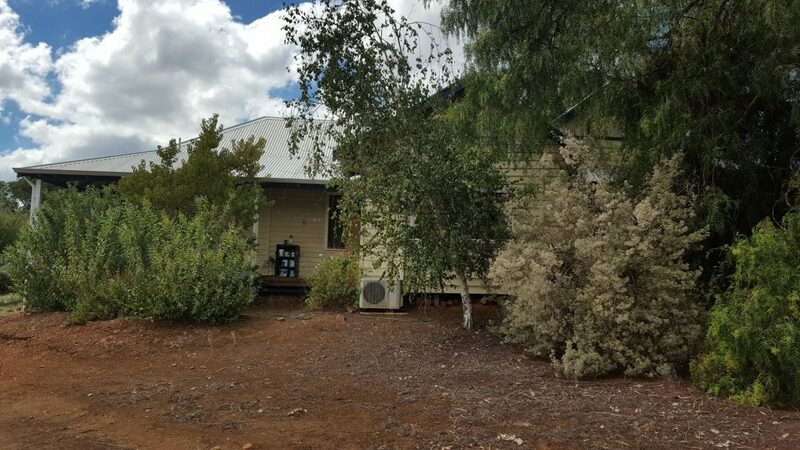 We moved to a leased property west of Pingelly. We had a few milking cows, my pony and a bull sent to Pingelly on a train. I had never been to Pingelly before. I didn’t know the farm and where it was because my father didn’t keep any riding horses for himself. I was given the job of droving the stock to the farm. I wasn’t very good at telling the difference between left and right so when my father gave me instructions I would put stickers on my hands to remember which was left and right. 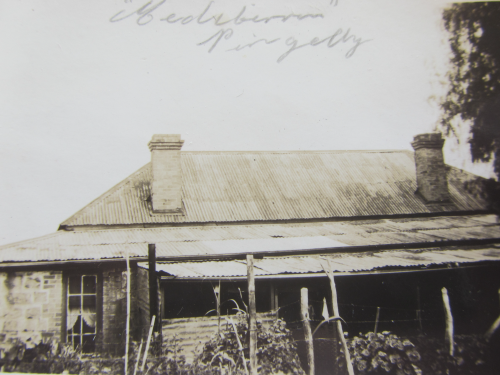 I struggled living in Pingelly. It was a contrast to our life in Bridgetown. Our homes in Bridgetown had electricity and running water to a farm house in Pingelly that had neither electricity or running water. I had to walk a mile to catch the bus to school which was 8 miles away. I often question the way my parents used me and came to the conclusion that children were regarded as a resource – to work around the farm. 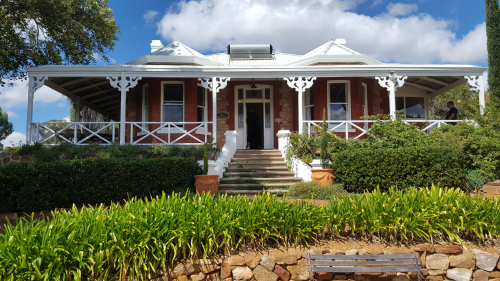 When we lived in Bridgetown we had several 14-16 year old boys (Fairbridge kids), one at a time, who worked on the property doing old jobs. The boy would live in the shed and weren’t allowed to eat with us.